Headed to Pixar Fest this summer? 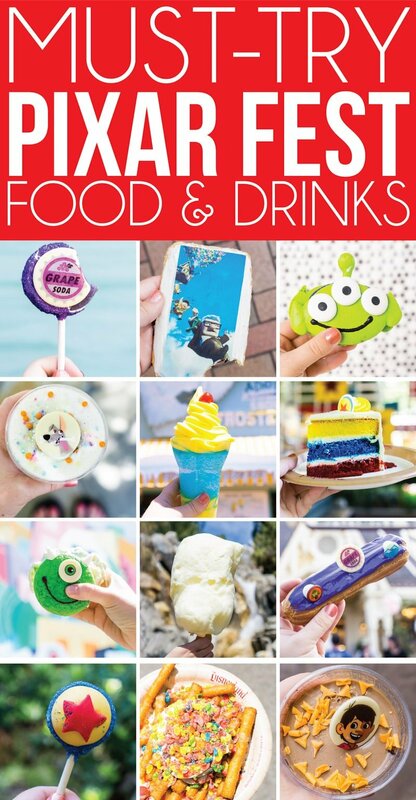 Read up on the best Pixar Fest food before you go with this great guide to all the food at Pixar Fest! The best things you have to try, things you should skip, a handful of honorable mentions and of course, all the Pixar Fest churros! 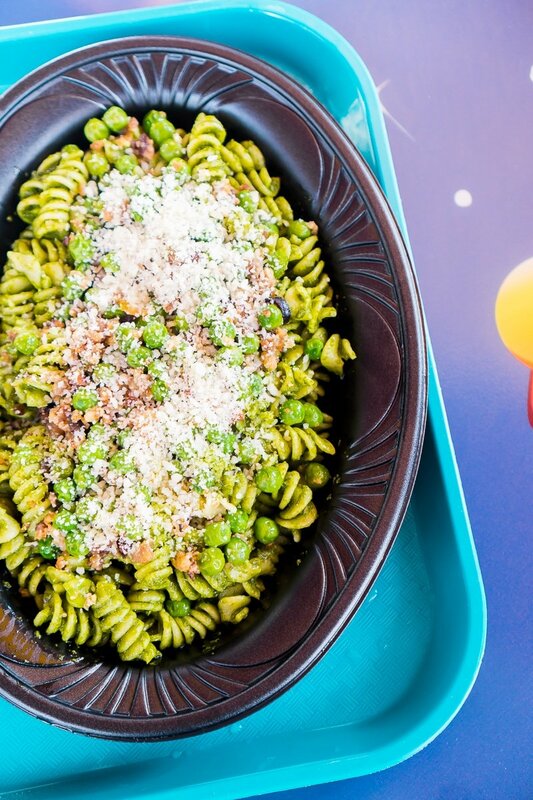 Get advice on what to eat at Pixar Fest from someone who has tried it all! After hearing all about Pixar Fest during my visit to Pixar Animation Studios in April, I knew I had to make time to check it out myself! 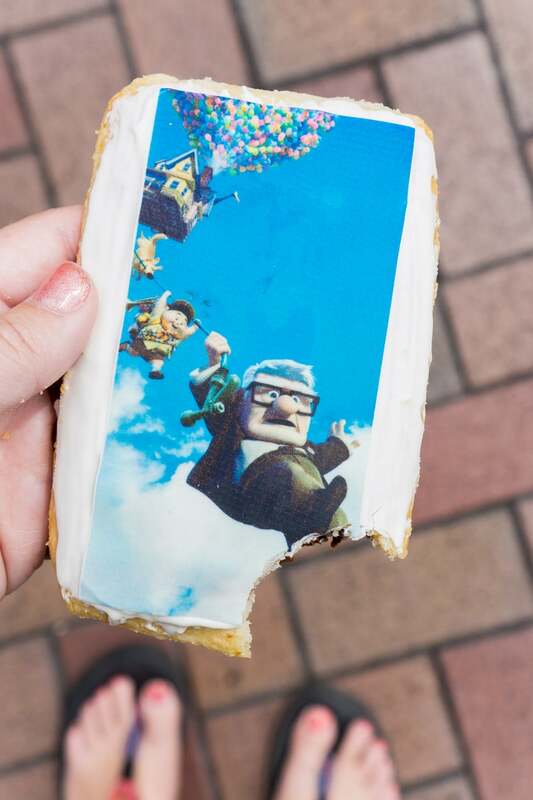 Luckily I was headed to a conference in Pasadena in early May and was able to add on two days just to eat my way through all of the best Pixar Fest food. I did other things too – a couple of rides, grabbed some Pixar Fest merchandise, and of course listened to the Pixar band, but it was mostly two days dedicated to eating and drinking all things Pixar. I’m not sure my partner in crime, Alexis, knew what she was getting herself into when I said I was going to Disneyland to eat all the things. I’ll be the first to admit that I did not try everything at Pixar Fest, but I came pretty close. I skipped a couple of the more full meal things like Carl’s bologna sandwich and the TV tray dinner at Carnation Cafe because who has time to sit down and eat a real meal when you’re eat Disneyland? Check out my full Pixar Fest guide before you go to see if there’s anything I didn’t include in this list that you want to try. So here you go. What I thought were the best of the best Pixar food and a couple of things I didn’t care for at all. Oh and a handful that were good but didn’t make the top of my list. And if you’re looking for info on Pixar Fest churros – those have an entire section of their own. I’m a bit obsessed after trying them during Halloween at Disneyland last year! Another disclaimer before we get into this list. This is my top list. It’s very possible that someone else won’t like something on this list, so I’ll apologize now if that happens and you waste your money on something that didn’t taste good to you. We’ve all got different taste buds – it happens. If you disagree, feel free to leave a comment with your thoughts. But for now, here are mine! They are in no particular order other than how my photos were loaded. In case you aren’t up on Disneyland acronyms, DL = Disneyland and DCA = Disneyland’s California Adventure. The first time I went into Jolly Holiday Bakery, I somehow missed this. They were either out or I just overlooked it, so I had to go back the second day for this beauty. It’s pretty and delicious – as long as you like Nutella. Because I’m pretty sure it’s just a sugar cookie type pop-tart filled with Nutella (or something very similar) and covered in a light layer of vanilla frosting. Unlike on the cake pops I’ll describe below, the picture doesn’t add any flavor, it’s just pretty. 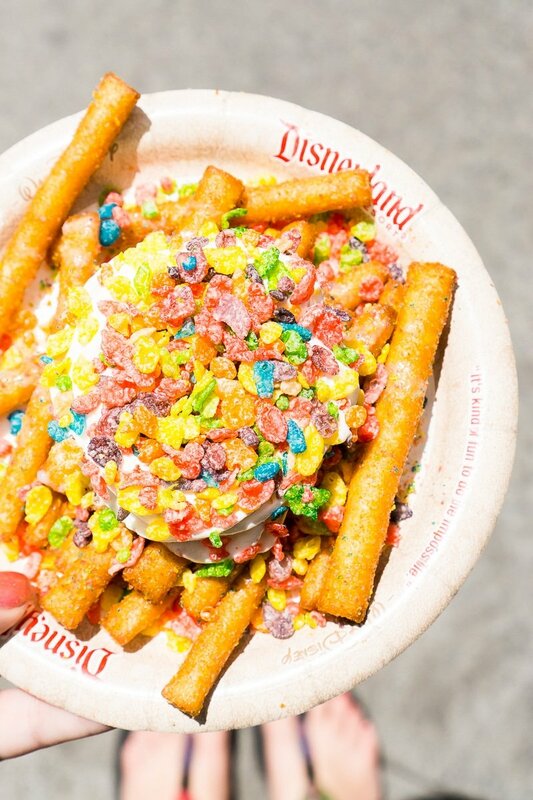 I’ve never had funnel cake fries before, but I’ve had funnel cake and Fruity Pebbles separately before. I had no idea they’d be so tasty together. While the fries could’ve been a bit more crisp, I’m pretty sure all funnel cake in the future should be eaten in fry form. I was expecting it to be too sugary but it just worked. 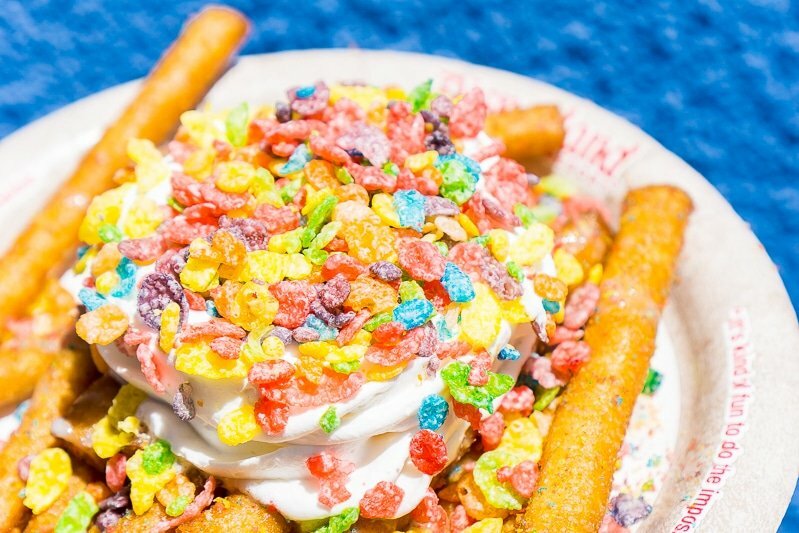 Alexis said that during Christmas they had another fruity variety of funnel cake fries, she liked even more than these ones, so sounds like I’ll be heading back to try those in December. Pretty sure this is on everyone’s must-try list because it’s just so cute. Luckily for everyone, it’s yummy too. The inside is filled with a purple filling of some sort and a bonus lemon inner layer that is delicious as long as you know it’s coming. My only complaint about this was the black frosting used for the mouth got all over the place and wouldn’t come off. Be careful where you place your hands with this one. And get two – you won’t want to share. 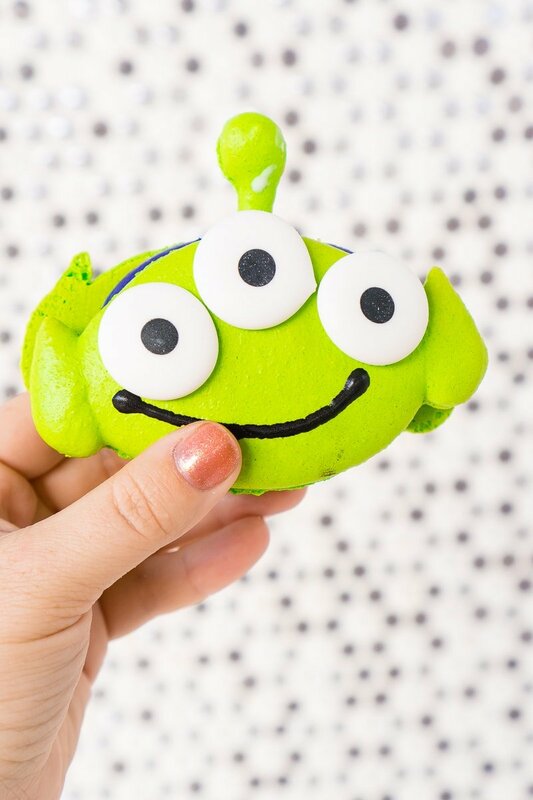 p.s., they also are offering a healthy alien parfait at Alien Pizza Planet. Skip it and go with this instead, it’s totally worth the calories! If you had to ask me which one thing I would want to eat again when I went to Pixar Fest, this would be it. It’s called a Whoopie Pie but that’s totally misleading because it’s actually a cookie + ice cream sandwich. Those green things are not whoopie pies, they’re soft green sugar cookies and so good. And inside, birthday cake ice cream. Cookies and birthday cake ice cream. Get one and be prepared to snap a photo as soon as it comes out of the window. You’ll have about five seconds before it starts melting. You may not have seen this one on previous guides to Pixar Fest food and that’s because it wasn’t open when Pixar Fest opened! 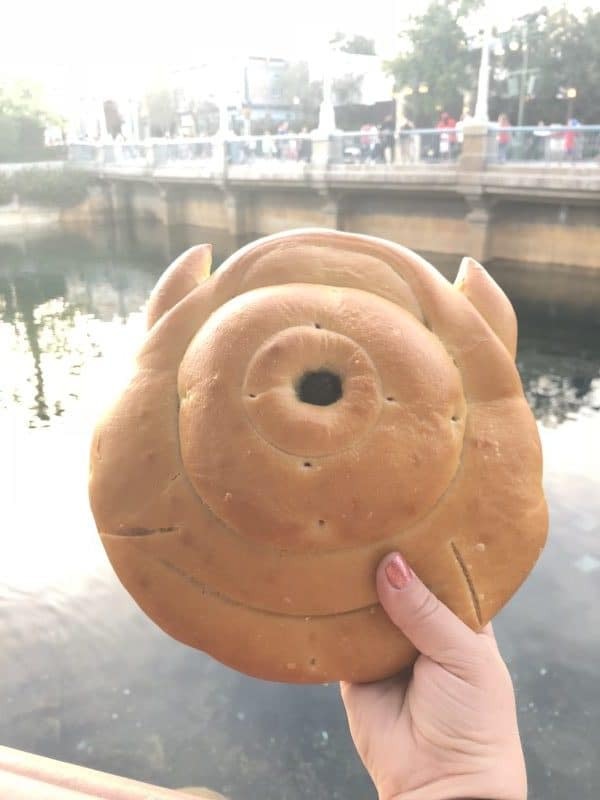 I mean honestly it’s not Pixar Fest food, but you have to try it! It just opened a few weeks ago ahead of Pixar Pier and guys, it’s so yummy. 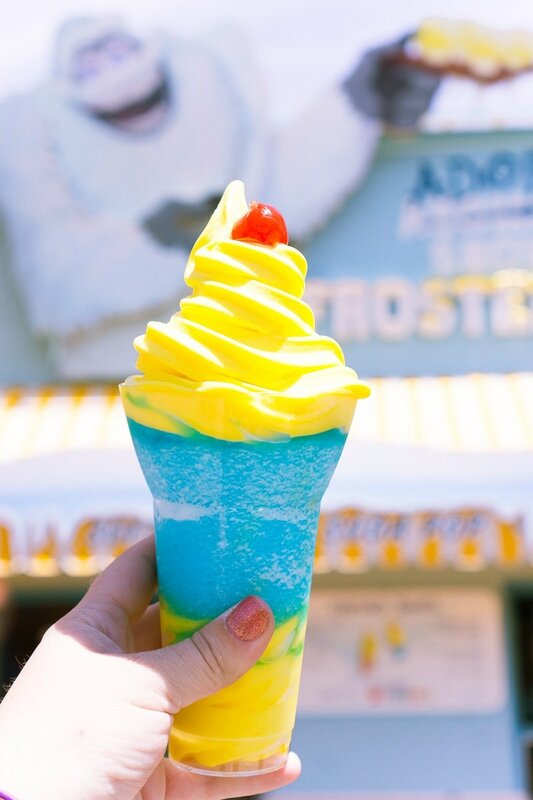 Think of lemon Dole Whip and you’ll have this frozen treat. And the frozen treat stand is a great backdrop for photos! 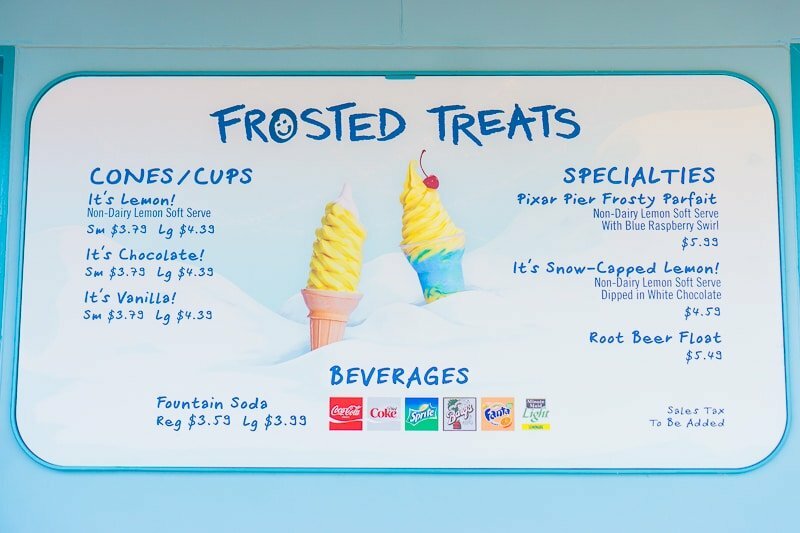 One word of advice – I’d just stick with the lemon soft serve and skip the Pixar Pier Frosty Parfait. The blue stuff in the parfait tasted like a 7-11 blue raspberry slurpee and was not my favorite. Next time I’ll stick with the lemon soft serve and skip the added slurpee. I put Paradise Garden Grill because that’s where I got it, but you can get this beauty at Paradise Garden Grill, Plaza Inn, and Pacific Wharf Cafe. It’s the same gorgeous and delicious layered cake anywhere you get it. I honestly didn’t expect to like it so much. Too often layered cakes, especially theme park layered cakes, are dry. This one isn’t. It’s flavorful and the layers of frosting between the cake keep it from being too dry. 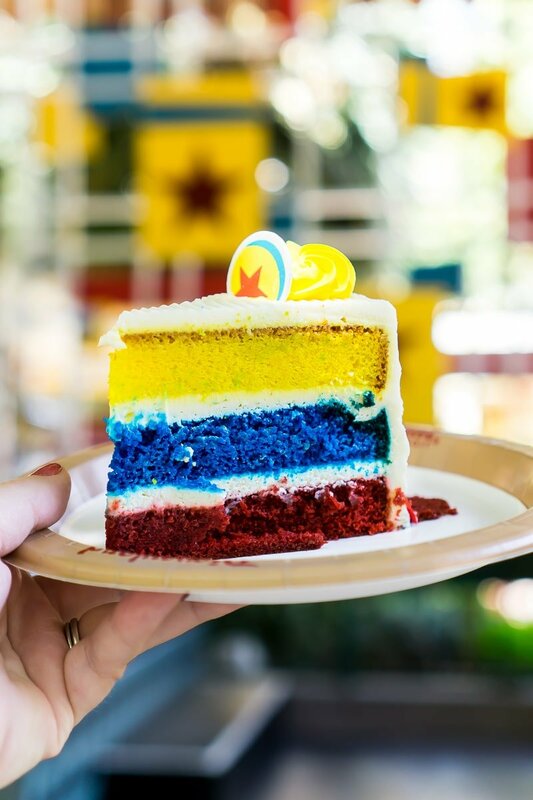 The layers are lemon, blue vanilla, and red velvet. 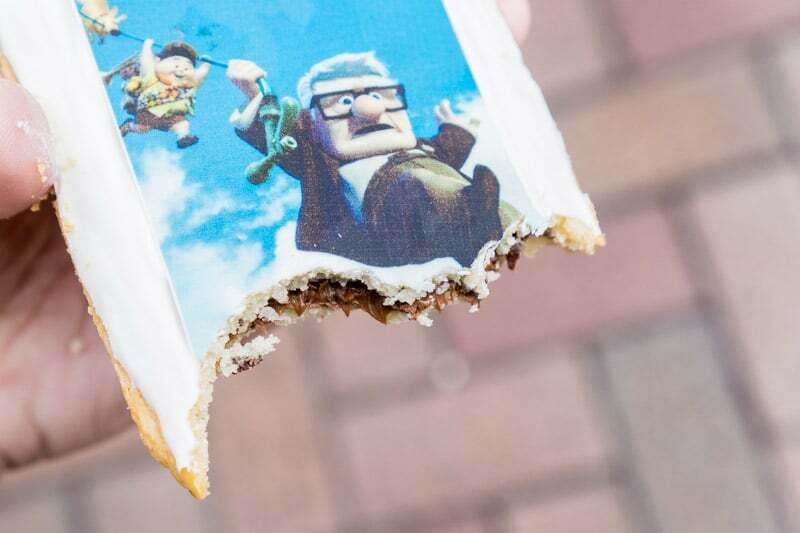 Add that to a hidden raspberry puree and the cream cheese frosting I already mentioned and Pixar really nailed it on this one. I know I said I didn’t really cover meals on this list, but this is the one exception. We had to eat actual food and not just dessert at some point. I was a little hesistant to get this because of the name – miso pesto pasta. I’m not a big fan of miso, really not a fan at all. But I love pesto, I really like peas, and I LOVE bacon. This was a great combination of all three. And that miso flavor? Totally non-existent. 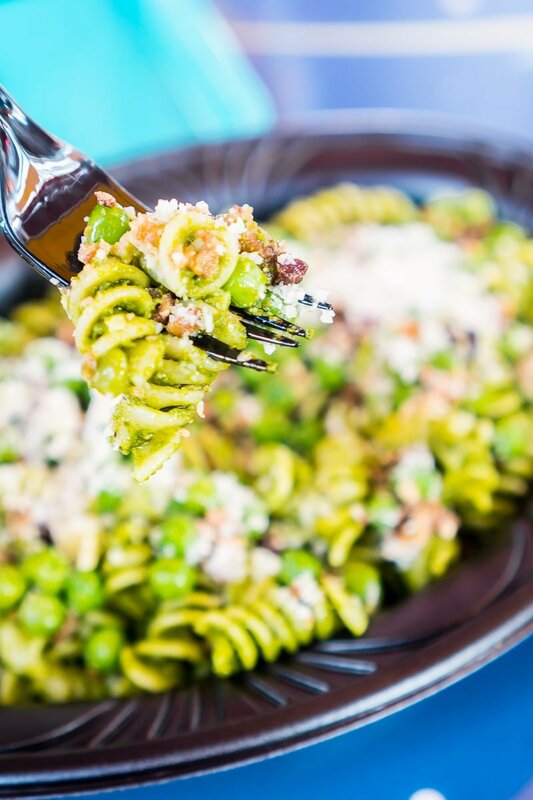 It’s pretty much just a pesto pasta with peas, crispy bacon, and lots of parmesan cheese on top. It was a great way to balance out all of the sweets. If pesto isn’t your thing, you can always just grab some pizza. Pizza is always good. This was the very last thing I ate before heading home from our trip, and I was expecting to be disappointed after trying and not liking the tres leches parfait. But this was nothing like the tres leches parfait. The chocolate tastes like a whipped chocolate pudding and there’s a layer of chocolate/brownie cake in the middle that really makes it more like a chocolate pudding cake than anything. Out of all of the parfait type desserts I tried, this was by far the best. And one of the few desserts that I actually finished the entire thing without being totally sugared out. 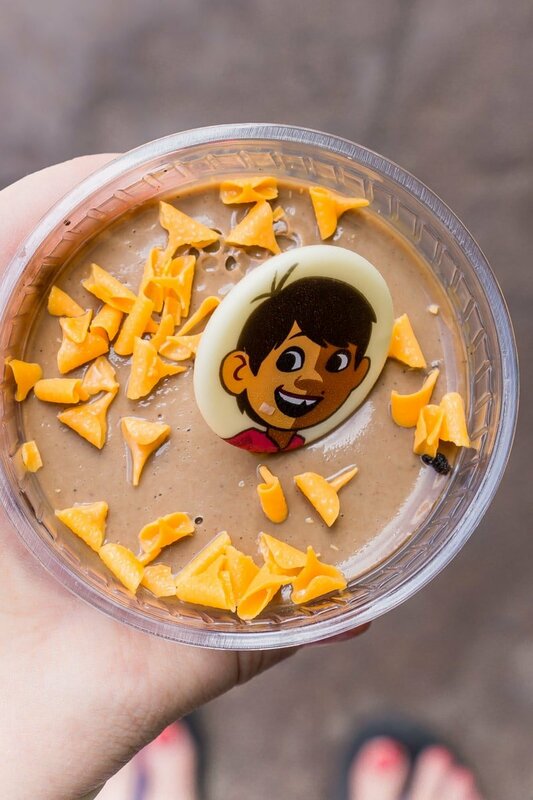 As a side note, Rancho Del Zocalo is a quick-service restaurant with actual meals but unlike a lot of the food places in Disneyland, you can just walk in and grab this chocolate pot de creme out of one of the refrigerators without having to wait in line to order real food. So unlike the bologna sandwich, it’s an easy one to grab and try quickly. Okay, now stick with me here. 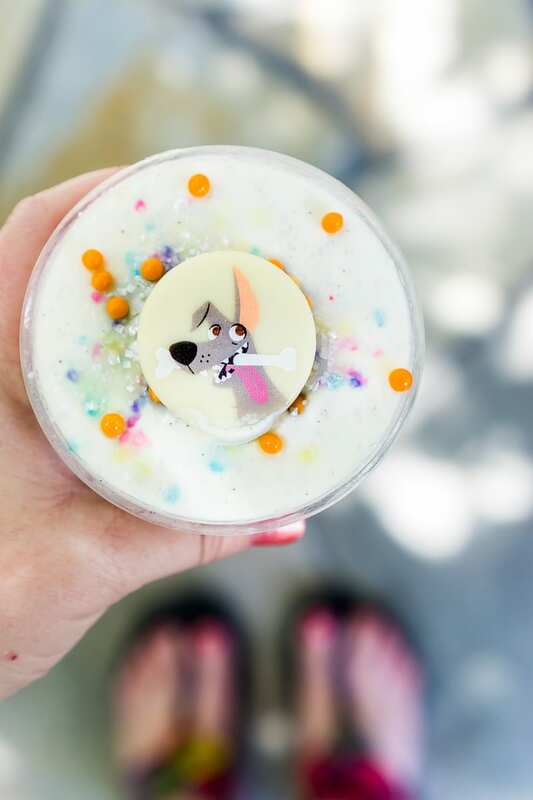 This is the only drink that makes this top list and it’s not because it’s necessarily amazing but because it’s the best Pixar Fest drink I tried. 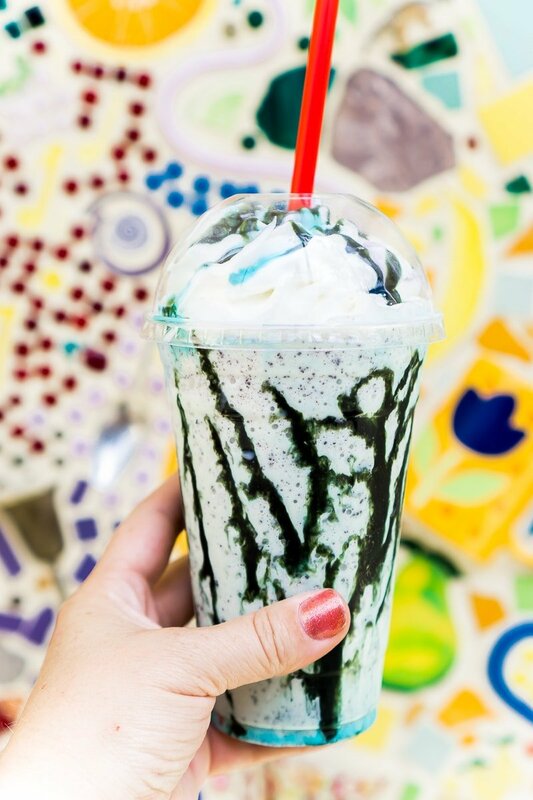 The others were not even really drinkable because they were either way too sweet or in the case of the mint chip milkshake, not worth the calories. 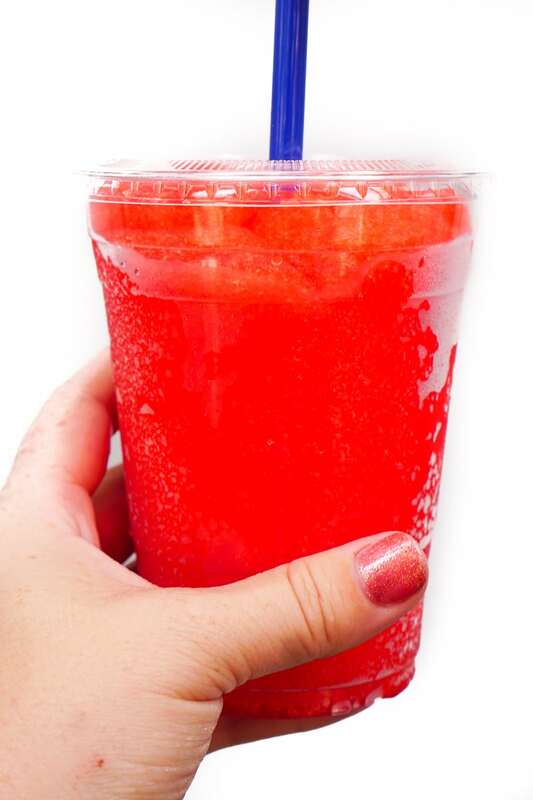 Award Wieners offers a rotating slush flavor. They said when we were there it was strawberry or grape. The strawberry was actually really good. Unlike the grape slush from the donut cart that was so sugary I couldn’t finish a tiny sample cup, this slush was more icy and slushy than sugary. It was refreshing, flavorful (without tasting totally fake flavored), and a great way to wash down the funnel cake fries. 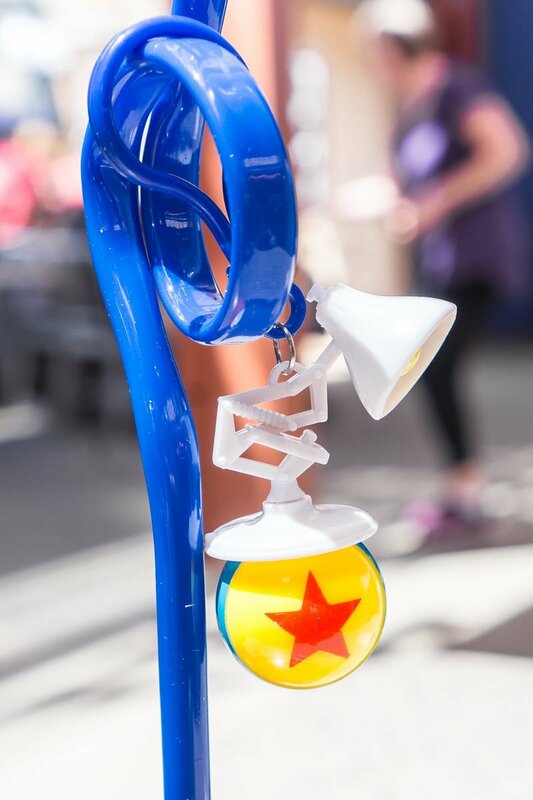 Even better if you get it with a cute Pixar lamp + Luxo ball straw. The little hanging thing actually comes off, and I clipped it to my purse to take home as a Pixar souvenir. My son quickly proceeded to break it, but that’s a story for another day. 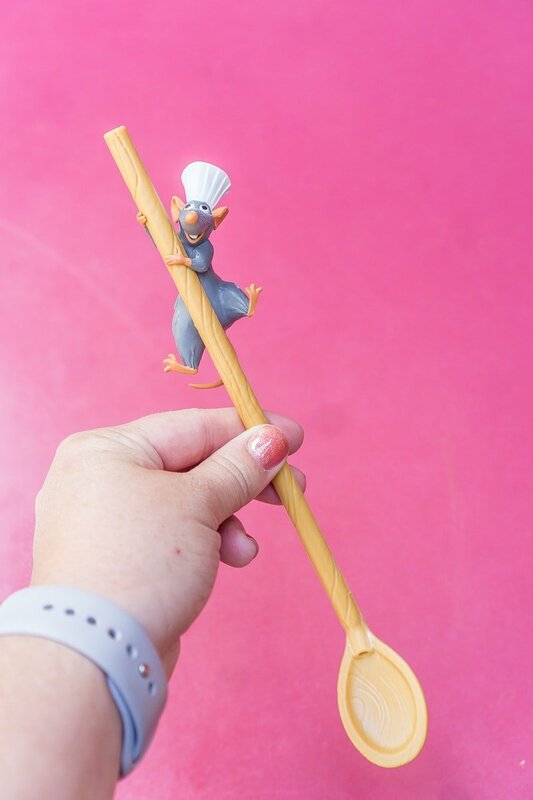 Another fun souvenir that’s not food – the Ratatouille straw. I got it at the Red Rose Taverne in Fantasyland but know they had them at least one or two other places. 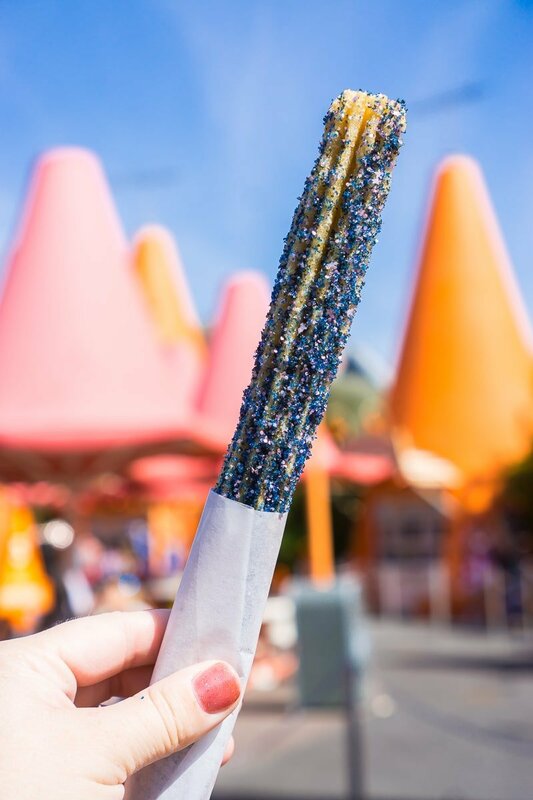 You’ll find this sour lemon cotton candy all over DCA and in Disneyland, they’re offering an orange and white striped cotton candy to represent Finding Nemo. If you’re going to try a cotton candy, try this one. Even if you don’t really like cotton candy, try this one. I’ve never had a sour cotton candy flavor before. The sour really stripped away from the over sweetness of the cotton candy and may for a cotton candy you could actually eat a full stick of. It may be the best cotton candy I’ve personally ever tried, even better than the pineapple cotton candy I tried during the Disneyland food and wine festival in March. So, I didn’t get a picture of these guys mostly because I ordered them without all the toppings. Onions ruin everything. I just had the crispy potato cakes with cheese on top, and they were delicious. 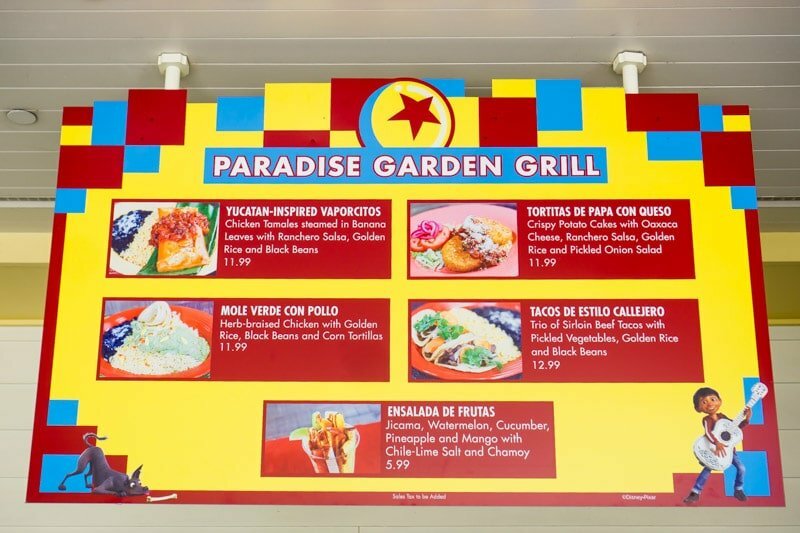 Next time I go back, I’m going to try the other things on this Coco inspired menu at Paradise Garden Grill. Now onto the list of things I personally thought were gross and recommend you skip all together. The saddest thing about this list is that I was excited about most of these things and they just weren’t good. Like at all. So skip these and save the calories for the items on the list above, churros, and maybe even some of the items on the good but not great list below. 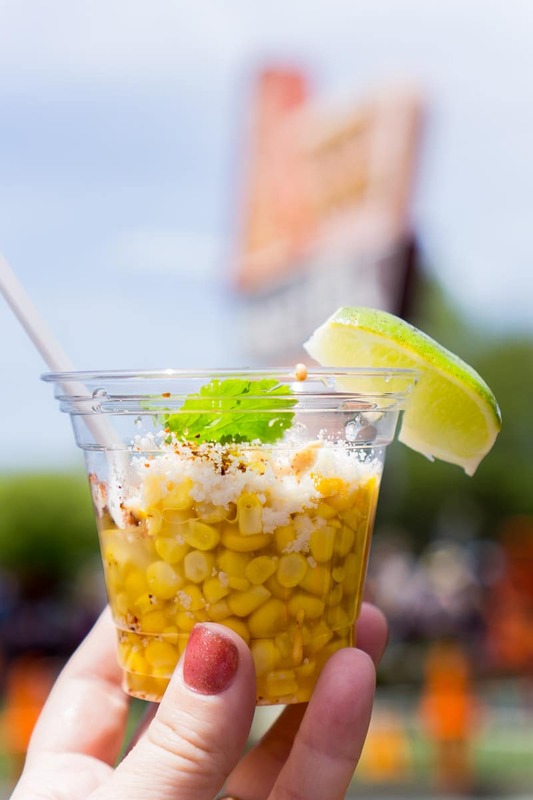 If you like the Disneyland corn on the cob I talked about this in Disneyland snacks post, you’re probably thinking this corn cup sounds amazing. 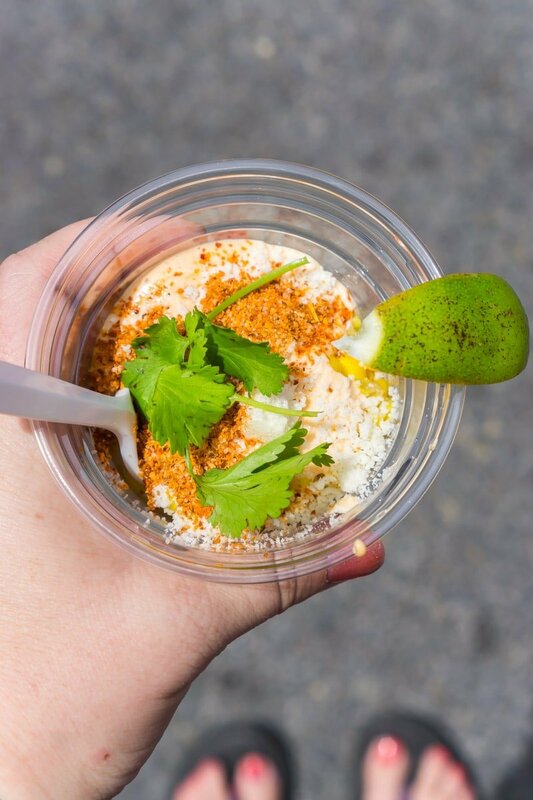 Fresh corn with flavored mayonnaise, cotija cheese, chili-lime spice, and lime. Sounds pretty much like a cup version of the delicious chili-lime corn I love. I don’t know if I got a bad cup of corn or what but mine was like filled with liquid – almost like they just poured canned corn that wasn’t strained into a cup then added all of the other things in it. I took one bite and had to spit it out because the liquid mixed with mayonnaise and cheese was just plain gross. And on top of that, they basically just dumped a bunch of chili-lime powder on top so the thing was spicy. Like really spicy. I couldn’t get more than that one bite down, nor did I want to. Get some popcorn or another churro instead. If you look at the second picture, you can see what I’m talking about with the liquid. Yuck. I’m a huge fan of tres leches. I normally like the combination of creamy and moist cake together. This was not that. It was just not good. I don’t remember why I didn’t really like it, I just took a bite and pushed it away. But Dante on top is very cute. Just like I’m a big tres leches fan, I’m also a big milkshake fan. And a bit mint chocolate chip fan, so I was really excited about the mint chip shake at Schmoozie’s for Pixar Fest. I took about three sips before I tossed it in the trash. This was not a milkshake. This was some milk flavored with mint and drizzled with chocolate. I’m sure there was ice cream in there somewhere but mine was so thin that it tasted more just like mint flavored milk. Totally not worth the calories or the wait in line. Skip this and go for real ice cream in the whoopie pie instead. The lady at the coffee cart was nice enough to let me try a sample of the frozen grape slush before I bought an entire cup of it, so I didn’t take a picture (sample cups are not pretty). I like frozen drinks but I thought it was way too sweet even to drink. I’m guessing the coffee cart cast member thought the same because when I asked her if it was super sweet, she nodded yeah and asked if I wanted a sample first. It’s definitely not one of those drinks I could drink enough of to make it worth the $5 price tag. While it’s cute, it’s also expensive and just bread. It was like $9 and humungous. And unfortunately because it was pre-cut and wrapped, it was actually pretty dry – nothing like the yummy fresh sour dough bread they were serving up otherwise. The eye in the middle is an olive. Oh and p.s., they said they sold this at Fairfax Market but I checked two days in a row (and asked) and they never had it. If you want to try this, I’d head to Boudin. These are a few things that I personally really enjoyed but they didn’t make my top 11 list. They were good but not amazing so if you’re only going to Pixar Fest for a day or two and not going to eat all the things, then I’d stick with my top 11 list instead. I’ve heard that some people didn’t like this and I didn’t love it as much as the Up hazelnut pastry, but I still enjoyed it. But the thing to know going into it is that it’s filled with peanut and grape jelly. It is not your cream filled eclair and tastes more like a peanut butter and jelly sandwich than a dessert. So if you like PB&J, you’ll probably like this. If you don’t, stick with its more delicious hazelnut counterpart. I really liked this funnel cake, but I didn’t feel like I could put two funnel cake dishes on my top 11 list and I liked the funnel cake fries more. 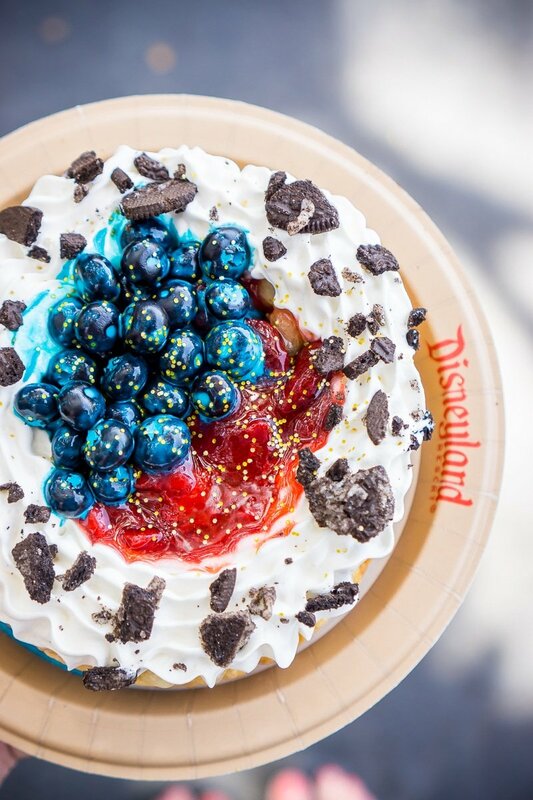 This is a funnel cake topped with creme anglaise, blueberries, strawberries, whipped cream, and Oreo crumbles. I could’ve done without the Oreo crumbles but everything else was delicious. And unlike a lot of funnel cakes, this was a double-layered funnel cake, which meant that with each bite you get a lot of funnel cake + toppings so the ratio of funnel cake to toppings was perfect. I’d get this again but probably only if I was splitting it with 3-4 other people. And I’d ask them to skip the Oreo crumbles. 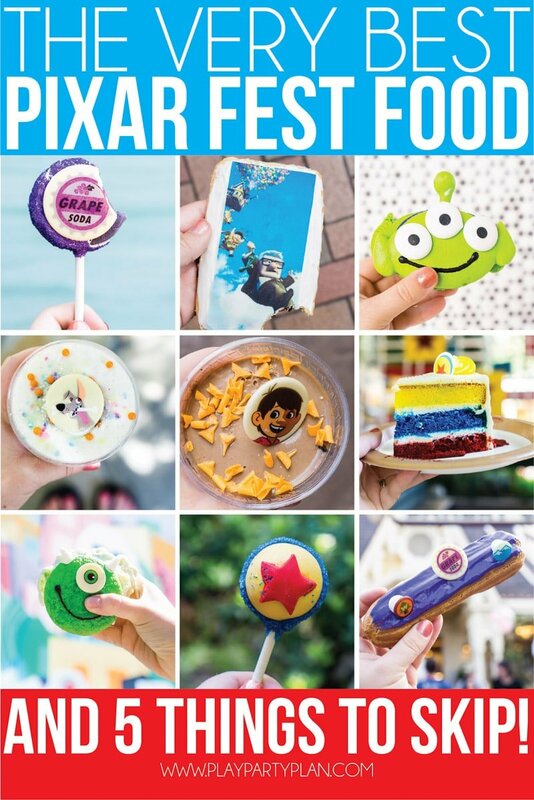 One thing you’ll notice as you’re exploring Pixar Fest is that there is a ridiculous amount of cute Pixar Fest food to be eaten. I couldn’t try all of the cookies, candy apples, cupcakes, and cake pops. So I decided to go with a couple of iconic cake pops and leave it at that. 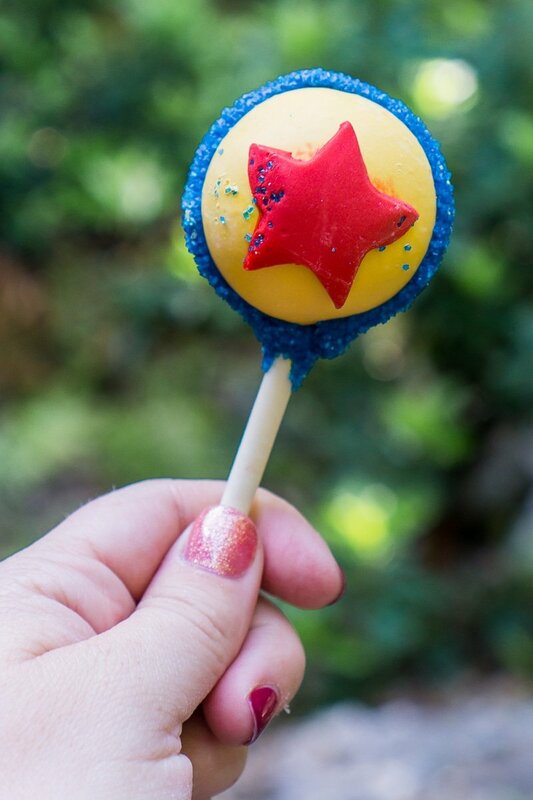 I’m guessing the other things like cupcakes, cookies, and candy apples taste just like if they weren’t Pixar themed. I chose the iconic Luxo ball cake pop and the grape Up inspired cake pop because it’s actually grape cake inside! And I’ve never tried grape cake before. Out of the two, I preferred the grape one surprisingly. 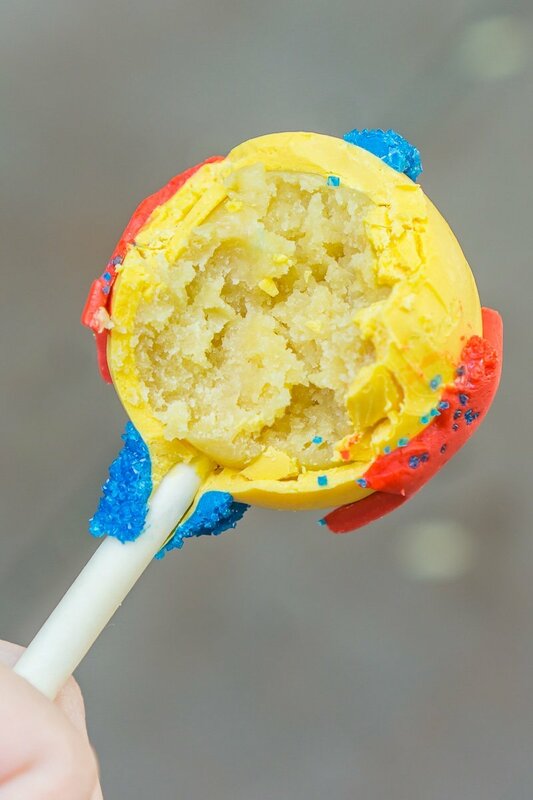 The Luxo Ball cake pop is so pretty but that ball takes a lot to make so you end up with this small ball of vanilla cake covered in a ridiculously thick layer of coating that you have to eat through before you get to the cake center. 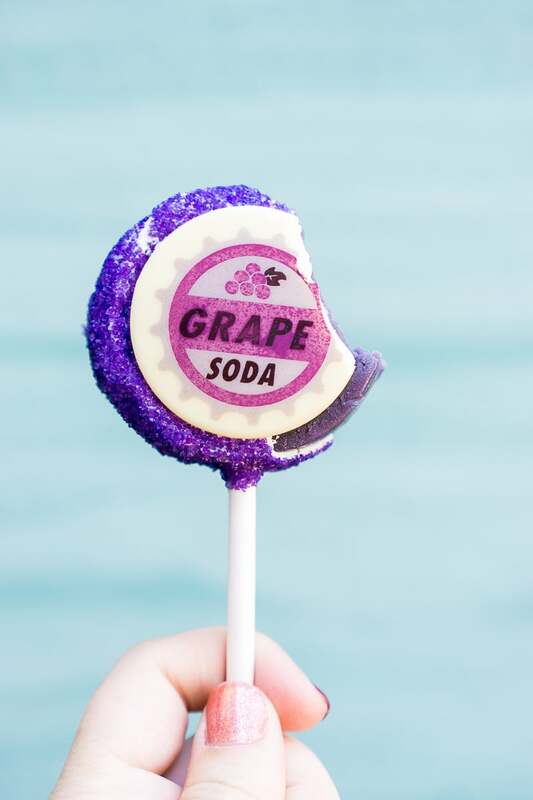 The grape cake pop on the other hand has a much thinner layer of coating, which made it easier and yummier for me to eat. 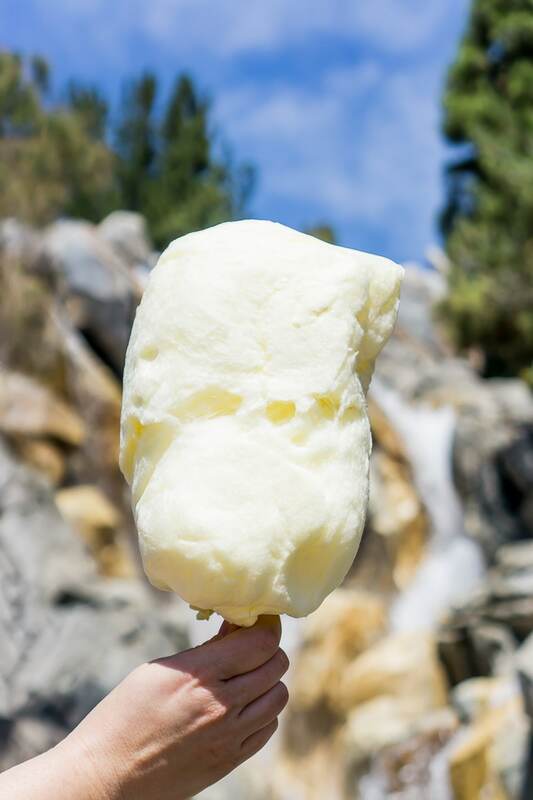 But if you like thick chocolate coating (I think it’s white chocolate at least), then go for the Luxo pop. The cake inside was yummy – coating just isn’t my thing. The grape one is definitely worth trying. This pretzel was good but not quite as good as say Auntie Anne’s cinnamon sugar pretzel. The big winner was the cream cheese dipping sauce, which made it just taste like dessert. 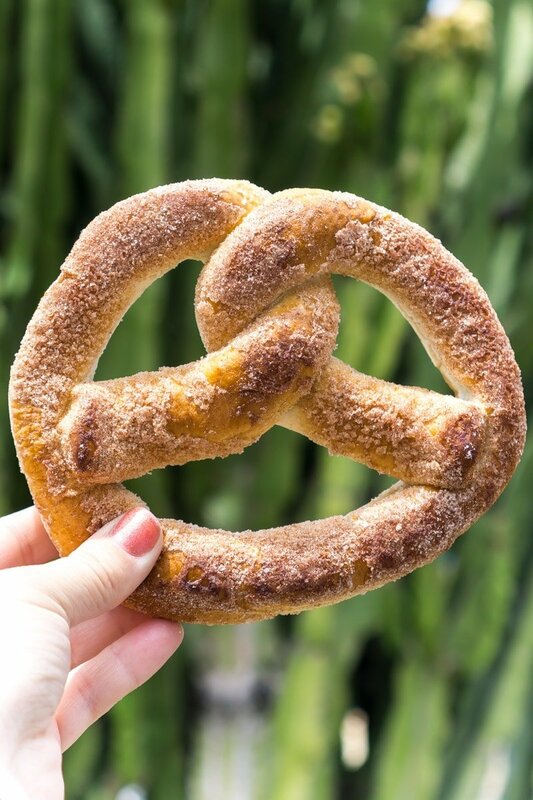 It’s not a must-try but if you’re craving a pretzel and want to try something new, it’s worth trying. 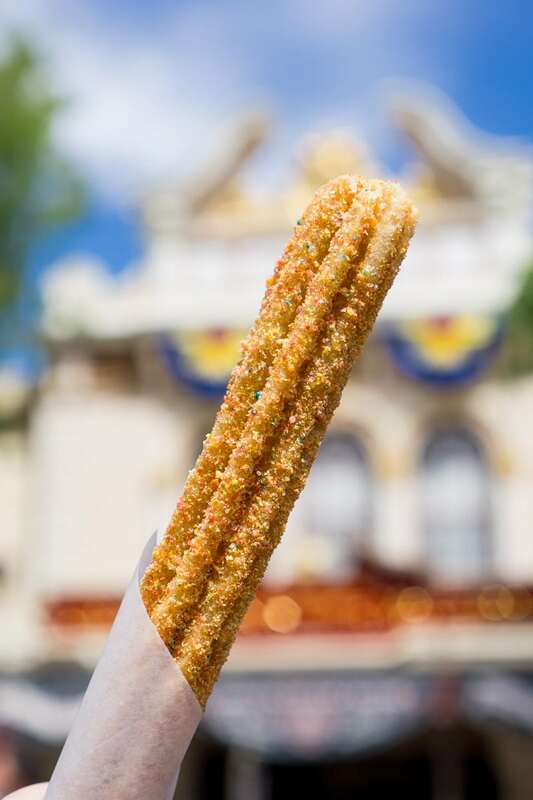 I can’t forget Pixar Fest churros and don’t worry I took one for the team and did the entire churro challenge, other than the strawberry churro in Tomorrowland, which I tried during the Disneyland food and wine festival back in March. 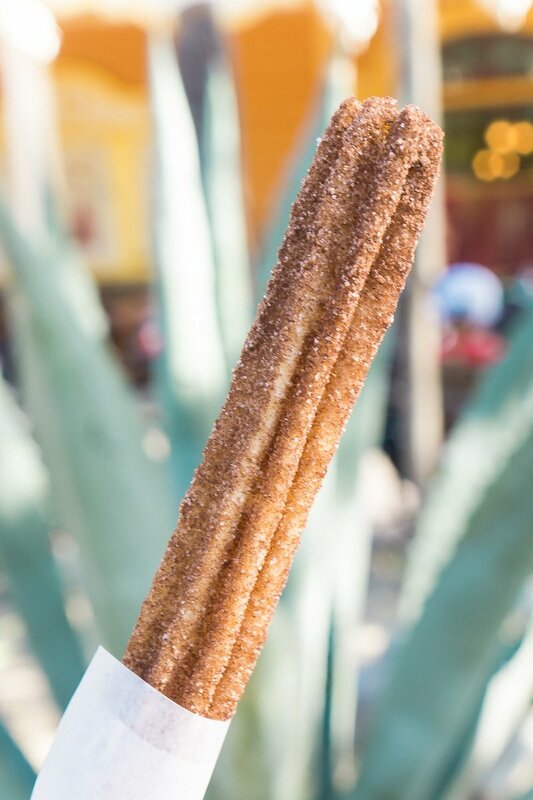 Here’s my take on these brand new churros as well as where you can actually find them. The town square churro was the bane of my existence. 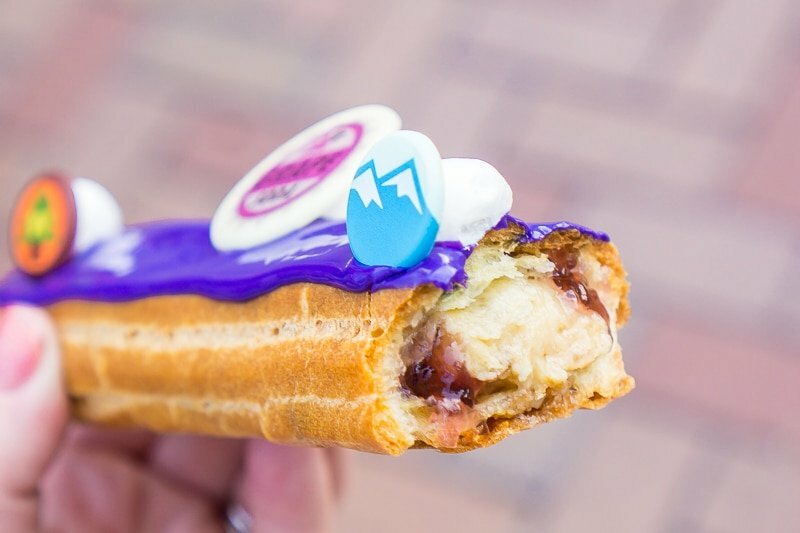 The Disney Parks blog says that this can be found both at the Town Square churro cart and the Sleeping Beauty Castle Churro cart. That is not true. We checked the Sleeping Beauty churro cart for two days straight and there was not even mention of this lemon churro. But you can get rose gold churros there. And for the same two days straight, we walked by the Town Square churro cart, which if you didn’t know is the first one you see after you walk into Disneyland before you head down Main Street U.S.A, and saw the sign announcing said churro, but the cart was closed. Finally with minutes before we had to drive to the airport, someone opened the Town Square churro cart for me to try the illusive lemon churro. It was not worth the hassle. I was expecting something lemony – like the alien macaron or the Pixar cake. I didn’t get lemon at all. I just got regular churro with an added dose of fruity sugar that tasted like the crumbs at the bottom of a box of Fruity Pebbles. It was good, not great. This is the one I mentioned that I tried during the Disneyland Food and Wine Festival back in March. No picture, but it’s red. Basically red strawberry sugar instead of the regular cinnamon sugar. Again, it tasted like a churro with a hint of strawberry. It was okay, but I preferred the regular churro. Out of all of the churros I tried, this was the most inventive and flavorful by far. It’s rolled in a chocolate powder and salted cinnamon sugar, which gave it a different flavor than the typical sweet churros. It comes with a Mexican chocolate dipping sauce, which by the way, had a bit of a kick to it that I was not expecting. This was probably the best of the Pixar Fest churros, and I’ll give Disney + Pixar props for coming up with a churro option that didn’t taste like a regular churro. 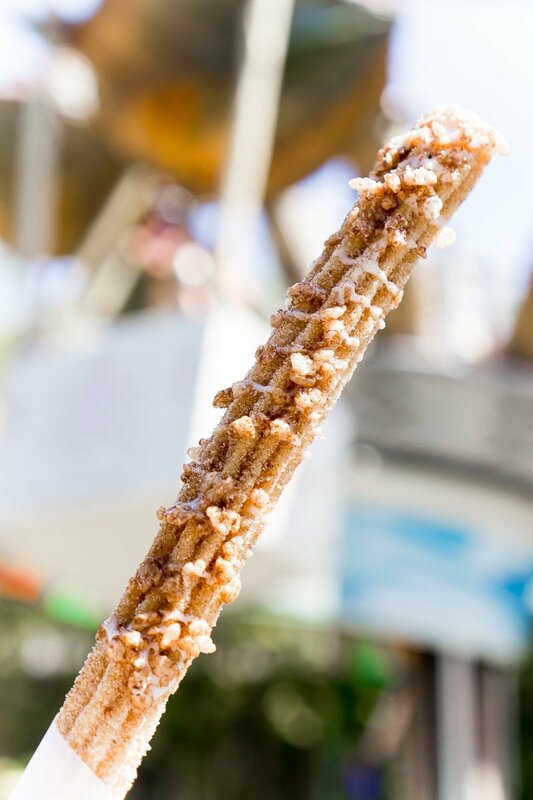 You’ll find this carrot cake churro at the churro cart closest to Haunted Mansion. This was the churro I was most excited to try. I’m a huge fan of carrot cake and cream cheese frosting. This carrot cake churro + a raisin-sugar cream-cheese frosting had me intrigued. And this one for me was a total failure. I actually thought it was gross enough that Alexis and I both took one bite and threw the rest away. Not because we were full from eating all the Pixar Fest churros, because we really didn’t want to finish it. The churro itself didn’t taste anything like carrot cake and the frosting was not any better. It tasted like something I couldn’t put my finger on but not something I’d want to eat again. At the Cozy Cone motel, you can choose from a red, yellow, or blue churro. I asked and they said that all three are the same flavor, just different colors, so I went with blue. This was the prettiest churro I tried all day and actually really yummy. I mean it tasted like a churro with a bit of added sugar, but I think the addition of star sugar sold me. 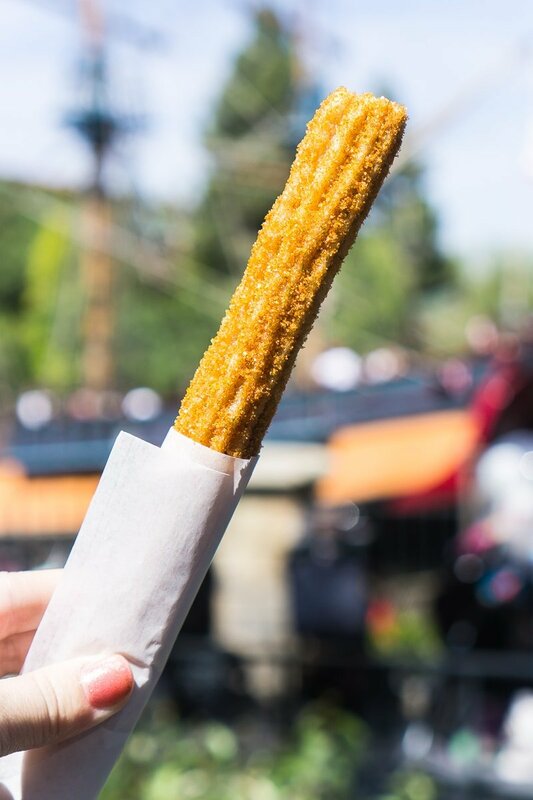 If I was going back to get a churro at Pixar Fest, this is the churro I would get. Sorry Coco. This is what I wish they’d do to churros instead of just adding extra sugar. 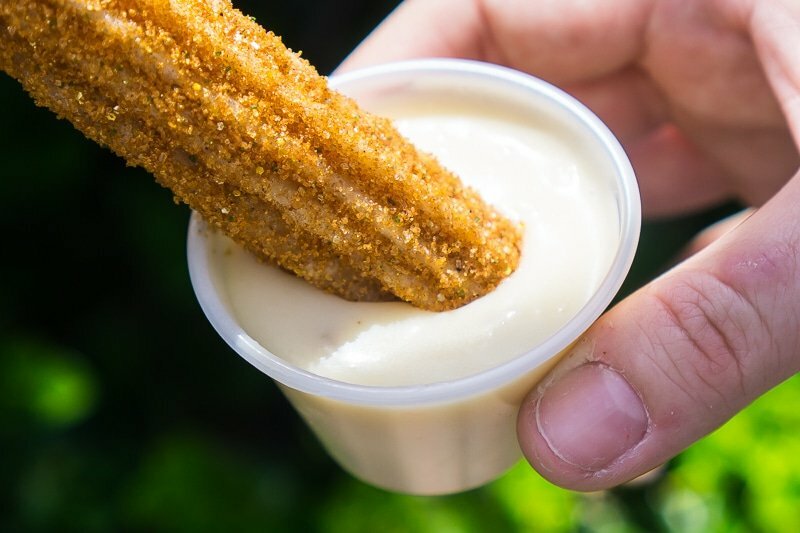 The Bug’s Land churro is a churro drizzled with doughnut icing and topped with cocoa cereal. 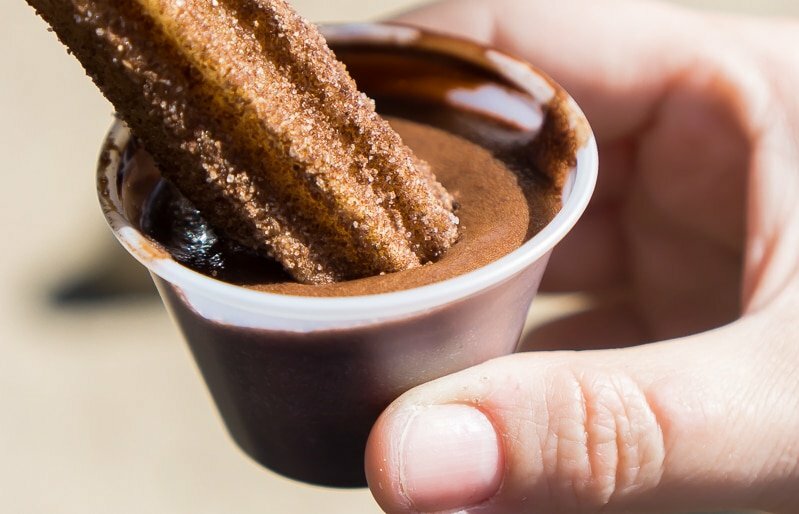 It transformed the churro into something different than a churro. The cereal on top added crunch and the icing added more flavor. 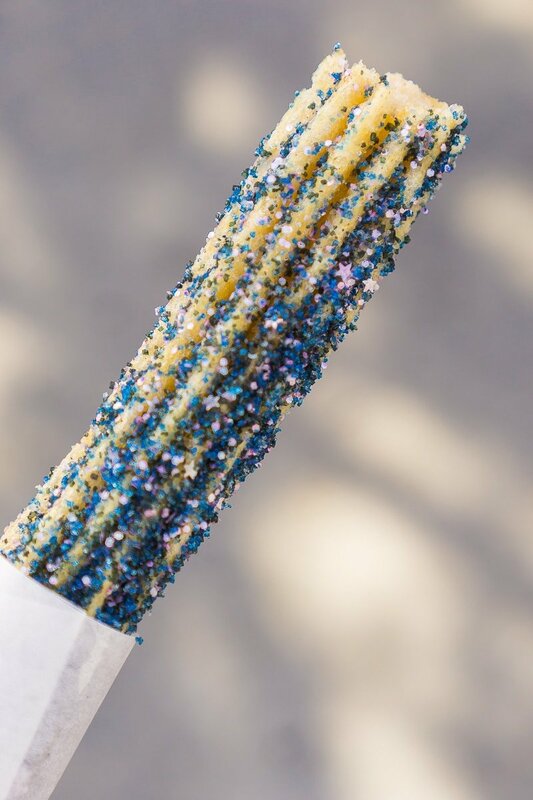 I hope next time Disney creates more churro options, they go more this route – toppings and texture, not just different colors/flavors of sugar. Here’s a full list of the Pixar Fest food item I didn’t try. If you try any of these, leave me a comment and let me know if they’re worth heading back again this summer to try! I purposely left off a couple of things because onions but some of them I’d still be interested in trying eventually! You’ll notice a theme – I tried most of the snacks, drinks, and desserts and left most meal type items for my next visit! 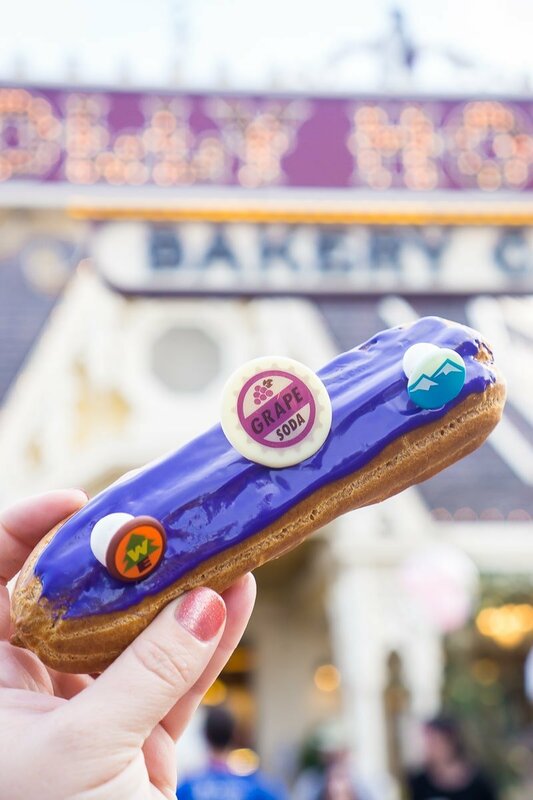 Up Inspired Doughnuts at the Main Street Coffee Cart – these sold out fast in the morning. She said they refill them at 5PM but by 6PM they were sold out again. They’re either really delicious or really cute because I couldn’t get my hands on one. Marshmallow Doughnut at Schmoozies – This looked like a cronut filled with marshmallow fluff and didn’t look appetizing at all. Hopefully someone will try it and tell me I’m wrong! Chilled Noodle Salad from Lucky Fortune Cookery – This sounds like such a fun color-changing dish, unfortunately cold noodles are not my favorite. Habanero Meatball Cone from Cozy Cone Motel – If this is anywhere as good as the mac and cheese cone I raved about in my what to eat at Disneyland post, it’s delicious! Because I wanted one when I was there, I’ve created a printable cheat sheet you can take with you when you go. It has everything available along with my recommendations for the best of the best, things to skip, and honorable mentions. No symbols for things I haven’t tried yet but hopefully soon! 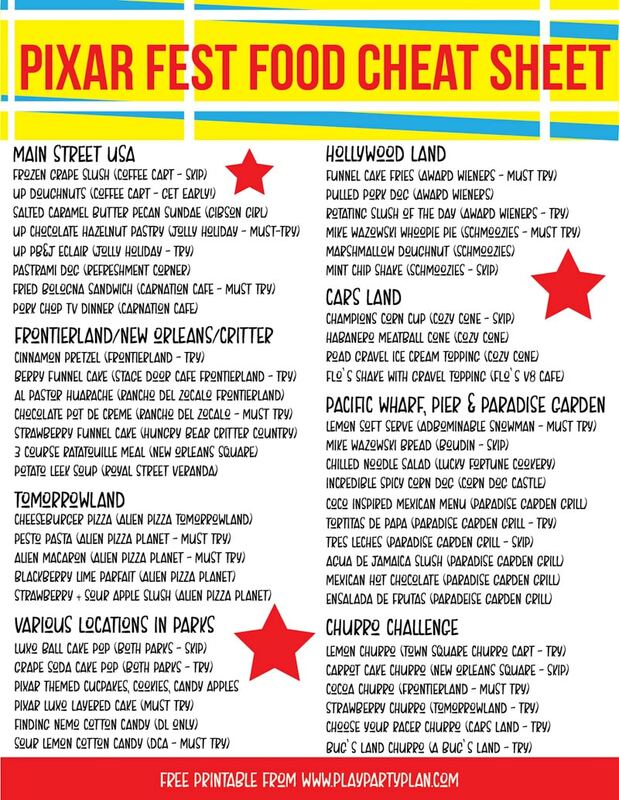 Don’t forget to pin this Pixar Fest Food guide for later! Just went to Disneyland. The app on phone was great to pre order food especially at corn dog castle. Long line but I walked up to mobile order pick up line. Got my two corn dogs hot within 2 minutes. Yes! Mobile ordering is the best. 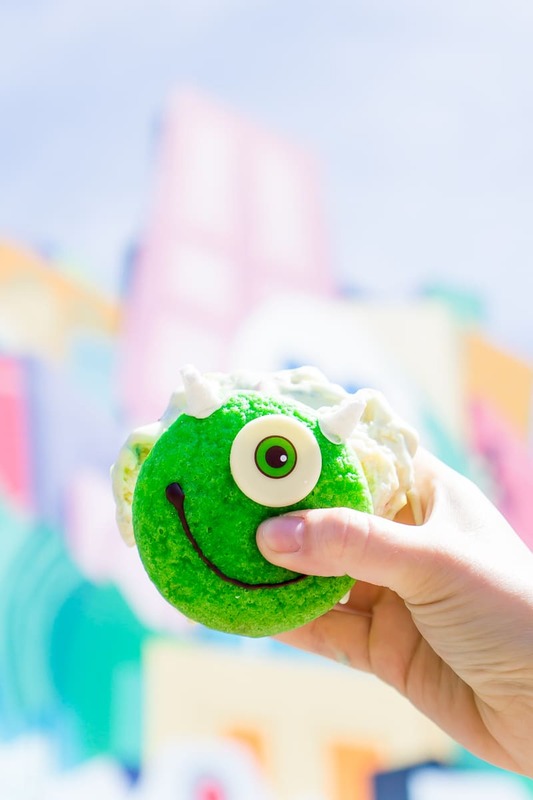 Oh my, the Sully souvenir is super cute! Is he a popcorn bucket or a toy?